As anxiety disorders are on the rise in the fast paced and highly pressured society we find ourselves being swept up in, it is vitally important to recognise the difference between seemingly similar emotions of anxiety and fear, so we can identify and deal with them in the appropriate manner. A key difference between fear and anxiety rests in the nature of the threat, as well as the physiological elements of experiencing the two distinct emotions. Anxiety and fear are described as states of being which encompass psychological, physiological and behavioural responding, triggered by particular events which are deemed threatening to the primitive drive of survival or well being of the individual, which are either actual or potential threats. The intense emotional state which is activated in response to a real, imminent and objective danger, which threatens life and survival. The “fight or flight” response is activated, which is a physiological state that functions to aid survival in life threatening situations by increasing physiological arousal to either stay and fight the threat, or quickly flee the situation. The person may experience a sense of doom, unease and apprehensiveness in response to the threat in their immediate environment. Examples are being held at gunpoint, being involved in a serious car accident, falling in front of an oncoming vehicle etc. An emotional state in response to perceived stress in the environment, it is subjective in nature. The source of threat may be undefined / unknown. Poses no immediate threat to survival. Is the anticipation of future potential threat, the “what ifs”, searching for potential danger. Experiencing small amounts of anxiety in short amounts of time may serve as a survival advantage in certain situations, as to keep you focused and on track to achieving a desired outcome; however a constant and intense state of anxiety may constitute disorder and dysfunction. Worrying and anxiety usually go hand in hand. Worrying often serves to prepare people for a perceived future threat and find potential solutions to problems, however worrying itself can become compulsive and people can develop a sense of lack of control or over their worrying, which may constitute a disorder. 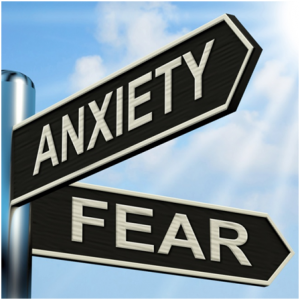 If you would like assistance in the treatment for anxiety and fear or to find a psychologist in Perth, contact us today.